(1) Simon Moore comments: The class 25 had worked the train from Torrington and ran round before heading for Bristol. I assume the same happened on the return but unfortunately I have no note of this. This tour was attached to the rear of the 09.55 Bristol Temple Meads-Portsmouth service train at Bristol, so the 25 was removed and empty stock for the service train was attached at the front with 33110. The same applied from Portsmouth as the charter was part of the 18.15 Portsmouth Harbour-Cardiff Central. So again at Bristol the 33 was removed and the 25 reinstated and the rear coaches uncoupled to carry on as the service train. 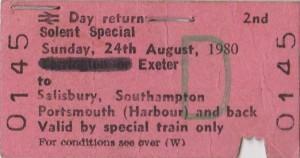 Simon Moore's ticket for this day excursion. Torrington 06.30d ? 00.11a ? Bideford ??.? ?a ~ 06.45d ? 23.55a ~ ??.??d ? Barnstaple ??.? ?a ~ 07.05d ? 23.35a ~ ??.??d ? Umberleigh ??.? ?a ~ 07.17d ? 23.25a ~ ??.??d ? Eggesford ??.? ?a ~ 07.34d ? 23.05a ~ ??.??d ? Crediton ??.? ?a ~ 07.54d ? 22.45a ~ ??.??d ? Exeter St Davids ??.? ?a ~ 08.15d ??.?? ~ 08.21 22.20a ~ ??.? ?d 22.20 ~ ??.?? Bristol Temple Meads ??.? ?a ~ 09.55d ? ??.? ?a ~ 21.05d ? Salisbury 11.09a ~ ??.??d ? ??.? ?a ~ 19.33d ? Southampton 11.42a ~ ??.??d ? ??.? ?a ~ 19.01d ? Portsmouth & Southsea 12.24a ~ ??.??d ? ??.? ?a ~ 18.19d ?